Written specifically to meet the needs of surgical technologists, Pharmacology for the Surgical Technologist, 3rd Edition focuses on the uses of medicines, agents, and solutions in surgery. An introduction to pharmacology covers basic math skills, pharmacologic principles, and drug administration, and is followed by detailed descriptions of common surgical medications along with anesthesia in surgical and emergency situations. This edition adds a new index of drugs by surgical specialty, and a companion Evolve website reinforces your understanding with practical activities and exercises, drug calculations, and more. 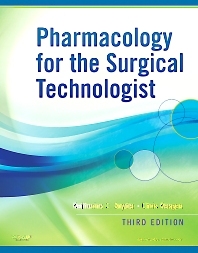 In this book, Surgical Technology educators Katherine C. Snyder and Chris Keegan cover all areas of pharmacology that are designated in the core curriculum by the AST (Association of Surgical Technology). Coverage of pharmacology includes all areas designated in the core curriculum by the Association of Surgical Technology (AST). A review of basic math skills and pharmacologic principles makes it easier to apply the information to surgical situations. Learning tools in each chapter include learning objectives, key terms with definitions, chapter summaries, and review questions. Important and practical advice is provided with Caution alerts, Tech Tips, Notes, and First Assist boxes. Common surgical medications are covered by category and include descriptions of surgical applications.